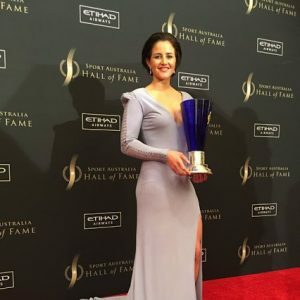 Michelle Payne has picked up the highly coveted Don Prize at the annual Sport Australia Hall of Fame Awards. The award, named after Sir Donald Bradman, is given to the athlete or team judged to have inspired Australians the most through sport in the last 12 months. The Don prize was bestowed to Michelle for her incredible 2015 Melbourne Cup victory which was packed with so many stirring elements. Michelle’s iconic victory as the first female jockey to win the Melbourne Cup was coupled with her forthright and inspiring condemnation of those who doubted the ability of females to succeed. Michelle in typically humble fashion hadn’t prepared a speech due to her admiration of the other nominees. “I could never have believed everything that has happened since the race, absolutely not in my wildest dreams. It was very much a life changing race”. Michelle has joined an incredibly elite list of sportspeople by winning the Don Prize. Past winners of the award include Cadel Evans, Ian Thorpe and Cathy Freeman. Michelle continues to inspire her country and her sport, after recovering from the worst fall of her career in May to be back on the horse, riding and training simultaneously.